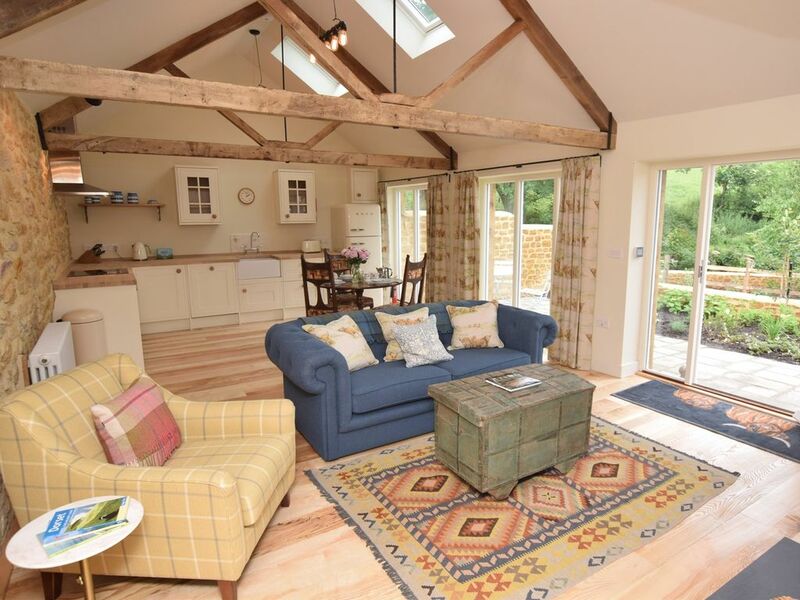 Set in a peaceful location within a working farm with characterful rooms and an abundance of charm. Nearby Stoke Abbott is surrounded by countryside making it the ideal spot for walkers and nature lovers. An abundance of pretty towns and villages are accessible from here including Beaminster and Bridport offering cafes boutique shops and restaurants. Heading south is the stunning Jurassic Coastline perfect for all manner of outdoor pursuits with much photographed locations such as West Bay and Lyme Regis being accessible by car. For relaxed days enjoy all that Dorset has to offer with attractions such as the National Trust owned Tintinhull Garden and Montacute House estate the Fleet Air Arm Museum and Dorchester all within easy reach. A long driveway leads you to the semi-detached property on entering you are met by a charming open-plan lounge/kitchen/diner. The kitchen area is well-equipped with an electric oven and hob fridge/freezer and microwave. Here you can enjoy romantic meals and plan the following day before settling down with a film in front of the wood burner on chillier evenings. Heading out of this room you will find a spacious bedroom with king-size four poster bed a pitched ceiling and a cosy sofa this room is the perfect spot to lose yourself in a good book it also has a contemporary en-suite bathroom with bath shower and WC. Heading outside you will find a pretty terrace with garden furniture and BBQ. Located directly outside of the kitchen/diner area it s the perfect spot for enjoying a meal outdoors on a warm summers evening. A few steps from the property is also a large raised decked area with outdoor furniture. This is shared with the neighbouring cottage and has lovely views overlooking the owner s field. Relax with a drink or dine al fresco while watching the resident lambs in the Spring. There is also a shared utility room in an adjacent block and one off-road parking space available within the nearby farm yard.